Iowa coach Fran McCaffery says junior center Adam Woodbury is not intentionally poking players in the eye. The latest incident occurred on Sunday against Maryland’s Melo Trimble in the Hawkeyes’ 71-55 win in Iowa City. Woodbury was eventually assessed a foul after the officials went to the monitor. “I know the kid, I know what we teach, and I know him, I know his character, I know his background. He does not want this attention, he does not deserve it, it’s not anything malicious, anything intentional,” McCaffery says. McCaffery says Woodbury apologized for the incident after the game, as he says they had the game firmly in hand and the last thing he wanted was to commit a flagrant foul and let Maryland back into it. “He’s playing the best basketball of his life. He had 16 points, do you think he wants to be out of the game with foul trouble. He’s too smart for that,” according to McCaffery. It’s the third time Woodbury has poked someone in the eye. 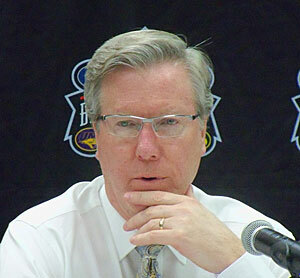 McCaffery says the eye pokes were simply an accident. “Quite frankly I think there’s way too much talk about it,” McCaffery says. Iowa returns to action on Thursday by hosting Minnesota.